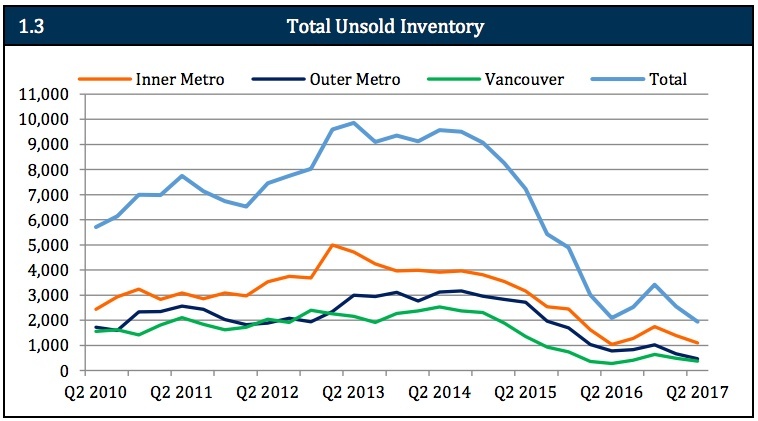 A new report on Metro Vancouver’s housing market confirms that a severe lack of supply in new housing stock has a significant role in the region’s housing affordability crisis. 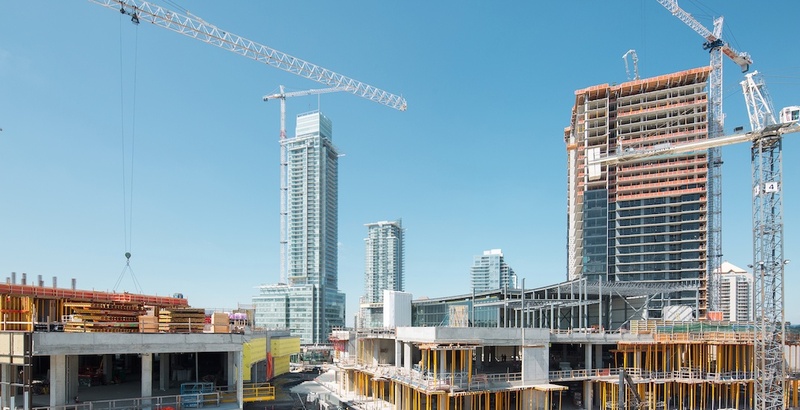 According to the Urban Development Institute’s latest update, there are currently zero new townhomes or concrete condominiums that are either completed or move-in ready within the city of Vancouver. Beyond the city’s borders, the rest of the Metro region only fares marginally better as only 50 units were ready for occupancy at the end June 2017. This represents a drop of 59% from the same period last year and 95% in the same period in 2015. The shortage conditions on new supply are highly unusual for a region the size of Metro Vancouver and its economic output, but it is also an indicator of the region being Canada’s fastest growing economy, which is aligned with population growth from both immigration and interprovincial migration. “Any home seeker knows we don’t have enough choices for them, in either new homes or resales. Various independent and academic studies have proven supply is being throttled by restrictive single family zoning policy and delays in permitting,” said UDI President and CEO Anne McMullin in a statement. McMullin said she “can’t find any good news in this report” and added that Vancouver needs to accelerate its rezoning of single-family areas to allow multi-family residences. Furthermore, the lengthy and contentious public consultation processes needed to be improved to create healthy competition and lower home prices. 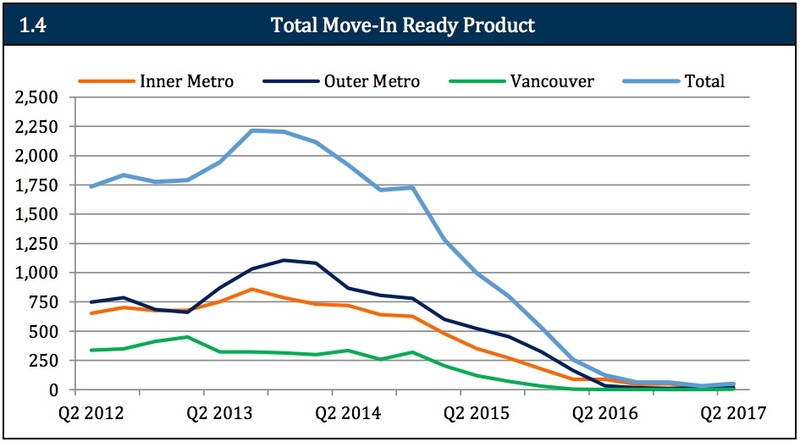 Any real surge in new multi-family housing stock, as proposed by the City of Vancouver earlier this summer, will still likely be years away – after the turn of the decade. Additionally, the report notes that housing starts are not a good measurement of supply, as 87% of all condominiums and townhomes released for sale since January were presold to meet the financing conditions of banks. Sales volumes plummeted by nearly half over the past year from 6,741 units in the second quarter of 2016 to 3,337 units in the last quarter. And the number of unsold new multi-family units across the region fell by 408% over the last four years from 9,858 unsold units to 1,942 units at the end of the second quarter of 2017. The average rental vacancy region-wide is still less than 1%, with the city of Vancouver leading the pack with an exceeding low vacancy rate of just 0.45%. In all cases, a drop in the supply of available inventory is to blame. An update on real estate values by the Real Estate Board of Greater Vancouver in June indicates the average price for a home in Metro Vancouver is now $1.019 million. The bnechmark price for a single-family home is $1.612 million while townhomes and condominiums are at $763,700 and $616,000, respectively.